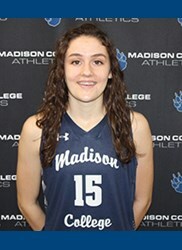 A freshman guard for WolfPack women’s basketball, Mary Raemisch recently put up solid numbers under the basket with 13 rebounds in the overtime win against Joliet. she also provided 3 assists to her team and scored 4 points of her own. A addition to the team at the start of the new semester, Raemisch was a success on the soccer team in the most recent season and clearly has a taste for competing regardless of the medium. When not duking it out in the N4C, she enjoys catching up on the endless stream of content being added to Netflix. She also likes to hike and play with her puppy, Riley. 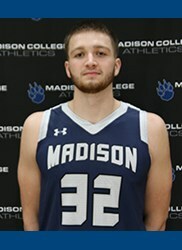 A freshman forward for the Madison College men’s basketball team, 6-foot, 8-inch Adam Anhold came off the bench to put up big numbers against the Joliet Junior College Wolves. Anhold recorded his fourth double-double with 16 points and 15 rebounds. He is also averaging a team-leading 17.7 points per game. When not on the court or working hard in the gym, Adam enjoys playing video games and spending time with those closest to him. A Liberal Arts Transfer major, he hopes to take his skills with him and continue playing when he leaves Madison.